Over the last few years, Akihabara’s Dempagumi.inc has been like a rising star in the current idol market, moving up from their small beginnings at local cafe, Dear Stage, to now performing at international venues and getting devoted fans all over the world. For me, personally, the group has quickly become one of the most exciting, important, and endearing idol groups in the industry today, so when I heard they’d be coming to appear in the US, I was beyond words at the opportunity to experience them up close and personal. I’ve gotten to meet and experience a lot of fantastic idol groups over the years, but Dempagumi is something I couldn’t possibly mentally prepare myself for. Thanks to Japan Expo USA, I was able to have a Dempagumi.inc experience better than I could’ve imagined and had a truly one-of-a-kind experience. I’ll break down the experiences by day, starting with the first day. 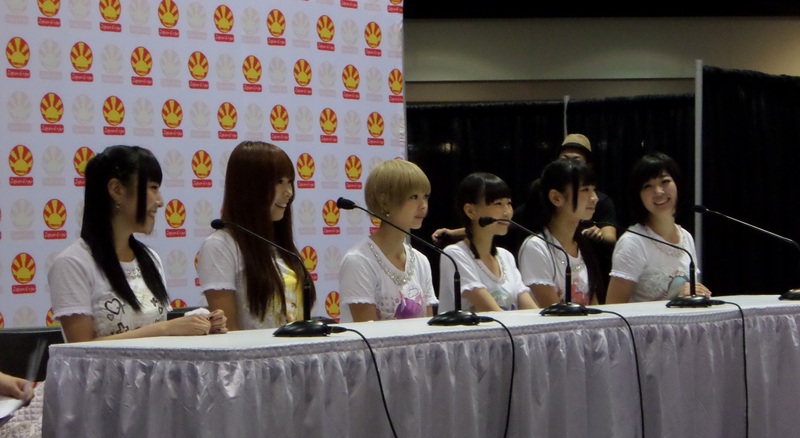 One of the earliest events of the whole convention was the Dempagumi.inc fan panel by Canadian fans and aspiring idol duo Ally & Sally. The panel was really early in the morning and didn’t have huge attendance, but they did a great job sharing lots of info about Dempa and getting lots of fans in the mood for the rest of their appearances throughout the convention. I was only able to attend for a short time since my interview with Dempagumi themselves was scheduled to overlap with the fan panel, but the time I spent there was fun and got me in the mood for the interview. Afterwards, I headed to my interview and waited anxiously for Dempagumi to arrive for the appointment. About ten minutes before the interview, I saw the group arriving to the interview area and greeted them, only making my anxiety even higher. Of all the idols I’ve met, I’ve never quite appreciated any of them in the same way that I do Dempagumi.inc, so my reaction at having the opportunity to personally greet them was my first clear indication that there really was something truly special and very personal happening here. I had never felt such a feeling of awe and nervousness from meeting idols before, but I knew I had to snap out of it because I had a professional obligation to uphold. I was soon called in to set up my gear for the interview. Just after getting my gear set up, the girls came in and I greeted them yet again and they set down their personal items and we tried to figure out a seating arrangement for the interview. Shortly after walking to the table, they noticed I was wearing my old Dempagumi.inc 5-nin T-shirt under my dress shirt, and the reactions were absolutely priceless. Eimi first noticed and started a total laughing fit and shared it with all the other girls, who all just started laughing with joy and giving me compliments on the shirt, which sent me into complete awkwardness and all I could do is profusely thank them for the compliments. After everyone settled in their seats, I introduced myself and shortly began with my questions, as my time was somewhat limited and I needed to make the most of it. My questions are in the bold text and their answers will be summarized below. SH: Hi everyone, how are you enjoying the US so far? It seems like Denpa would fit in well in California, with all the unique and independent styles and fashion here. DI: Wow, thank you for the comment about our styles and fashion, we hadn’t even thought of that! We’re really enjoying the stay so far, especially since we learned this area is what they call “Silicon Valley,” and since we all love indoor activities, computers, and technology, that’s a big thing for us. This place is home to all these companies we love like Google, Apple, and Intel, which makes us really excited, we really want to go visit there. SH: I discovered Denpagumi in early 2012, after you had already been around for a few years, but you’ve grown so much as a group since your early days. To what do you attribute the growth and increased popularity you’ve had since the early days of Future Diver and the indie days of 5-nin Denpagumi? DI: Well, of course we all started as waitresses at Dear Stage but over the years we started doing more songs for PC games and other kinds of promotions that got us more known. This kind of thing also helped us connect more with the otaku crowd more than we already did, which is one of our main goals. We started having our music be much more personal to who we are and I think this also strengthened our power and charisma as a group. SH: Do the members have any input on choosing future songs for Denpagumi.inc, or are you presented with the songs after the decision has already been made? DI: Our producer, Mofuku-chan makes most of the song decisions and stuff like that, and we’re presented the songs after completion. She understands us so well that we’re always amazed how well most of the music just ends up matching our personalities and us as a group. SH: What has your experience been like in working with Maeyamada-san (Hyadain)? He’s currently one of my favorite producers and he seems to have a very fun personality, but also seems like he can be very serious when work needs to be done. SH: I greatly appreciate the honesty of the group in all your interviews and lyrics. Can you comment on what inspired Denpagumi’s relative bravery to speak honestly about yourselves when most idols tend to stick to the usual generic “idol” image in their activities? DI: We’re not necessarily trying to be honest, we’re just really not good at playing a personality act or covering things up! (laughs) We’re very open and proud of ourselves and what we’ve accomplished, so we don’t think about it, we just be ourselves most of the time and don’t think about putting forth a certain image. We’re glad you appreciate it. SH: You may know this already, but there’s a common term going around in Japan right now that people use to describe the current idol industry boom, and they call it the “Idol Sengoku Jidai” because there are so many idol groups on the market right now all competing against each other. Do you feel like this large amount of competition mostly helps or hurts Denpagumi’s success? SH: Who are your favorite idols or artists you enjoy listening to, and who would you like to perform with in the future? DI: We’re largely into lots of anime-related artists, its really where most of our inspiration comes from, not so much from your usual “idols” in the traditional sense. Artists like May’n, Wienners, Kanno Yoko, Sakamoto Maya, lots of various anime seiyuus, Kajiura Yuki, Kalafina, Tamura Yukari, etc. SH: What is the overall goal for the group? Do you have one? SH: What is your message to overseas fans and how can they follow Dempagumi.inc after Japan Expo is over? DI: Please continue to spread Dempagumi.inc through our various internet sources and Twitter, and we hope to come back someday. I thanked everyone for their time and let them know I would be at all their other activities later in the day and the following day. As I was packing up my gear from the interview, the girls all noticed I had lots of badges and pins from anime, idols, and video games on my gear bag and all gathered around it, pointing out all the things they loved. Eimi particularly loved my pins from the “Slayers” anime, while Mirin and Nemu struck up a short conversation with me about my MegaMan (RockMan) badges, and Risa commented on my Berryz Kobou badge. I couldn’t imagine a better way to end an interview. After the autograph session concluded, the girls headed over to get ready for their concert, since there wasn’t much time in between the two events. The waiting line for the concert also built up just before, with more fan camaraderie and pre-concert wotagei going on. We were finally let in to get seated for the concert, and most of us were very happy to get this close to the performance, thanks to the nice stage setup Japan Expo had for us. The concert was quite an experience to behold, even for those of us who have watched lots of Dempagumi performances on video before. The intensity of fan interaction was very overwhelming, contagious, and energizing and the girls were really interactive with everyone. The sound was mixed very well and loud, which is the way it should be for a group like Dempagumi who has more of a rock concert feel to their shows, despite the lack of live instruments. They belted through all of their singles since Future Diver (except WWDII) and a couple of their great b-sides like their idol-infused cover of the Beastie Boys’ “Sabotage” and one of my personal favorites, DenDen Passion’s b-side “Orange Rium.” The hour-long tracklist was perfect for Dempagumi newcomers, even if it was missing a few of my other personal favorite songs, it was chosen well, given the event it was for. Hearing some of my favorite songs live and having the group singing it just a few feet from my face was a pretty moving experience, up there with some of my best concert experiences I’ve had in all my years, so I’m very thankful Japan Expo was able to set everything up the way they did. After their set, their staff had set up an impromptu merchandise table to sell some of the group’s official goods. They came with a very limited amount of goods, possibly underestimating how many people would be so willing to shell out their hard-earned money for the goods, but most of the hundred-plus items they brought were gone within a few minutes of the concert letting out. They had multiple CDs, t-shirts, towels, books, and probably the most popular item, individual Polaroid mini-pictures taken on the same day and autographed/decorated by the members. These were chosen out of a box at random for $5 each, with some fans willfully handing over $100 bills to get their chance at more unique photos. There was lots of trading and celebration over getting your favorite member, with lots of positive energy all around. I accidentally (almost literally) ran into the girls as they were leaving the backstage area after the concert, I almost walked right into one of them as they came from around a corner. I stopped quickly and told them to go ahead as I waited, and they all waved and said “thank you” as they headed over to their final activity for the day. 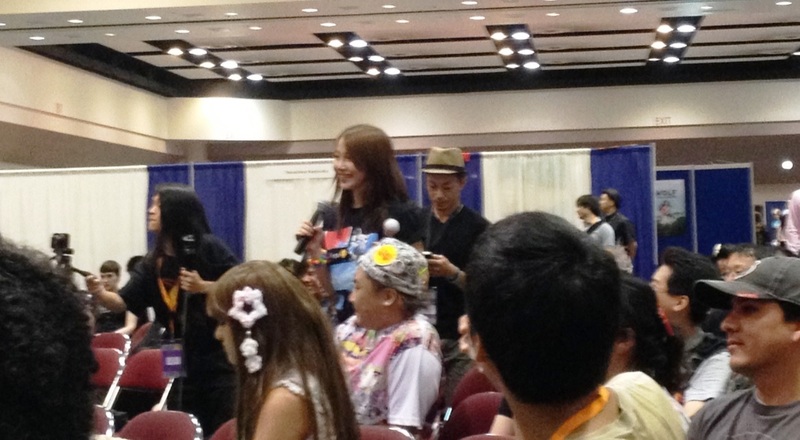 The final activity was the panel in the main hall where fans could come and listen to them talk and ask some questions. We had a lot of fun with Dempa at the panel where there was lots of discussion about anime and cosplay, and some general questions about the group. After the panel let out, their activities for the day were over and everyone dispersed to go back and rest after such an exciting day. We all needed to get a lot of rest for the final day of Dempa appearances on Saturday. 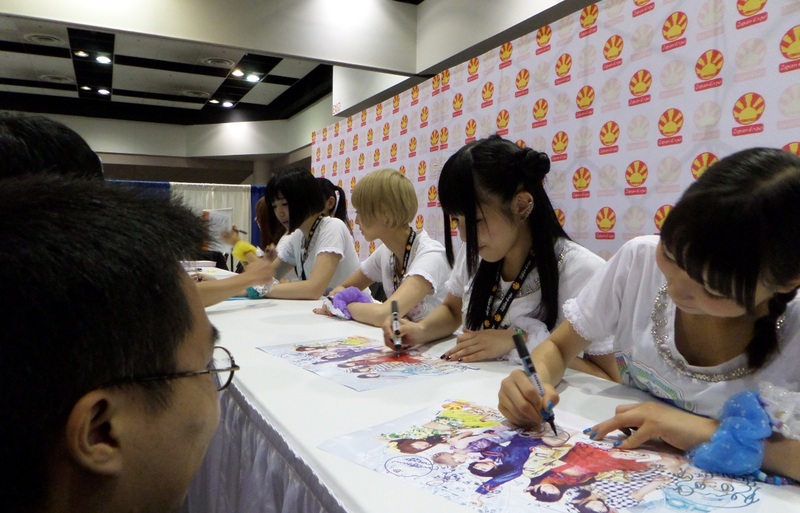 Day two started with Dempagumi doing their final autograph session, and much like the first one, the lines spanned well out into the convention center with loving fans lining up to see Dempagumi up close for the last time of the weekend. Lots more emotional moments and fan bonding took place here as everyone waited for the session to start and there was lots of Dempagumi love in the air. After the second show, they still set up the merchandise table, but they only had about three items and a box of photos left, as everything else had sold out the previous day. Lots more photos were bought and there was a lot more trading and talking after the show as all the fans got together for the last Dempagumi-related meeting. It was sad to know this was the last time most of us would see the girls for a long time, but based on some of the experiences that fellow fans have shared online already, we have a lot to take away from our experiences here. We met lots of friendly fans from all over the world and many people who we had only known online previously, so as with many other idol events, the event isn’t just about seeing the idols themselves, its about bonding together as a community and meeting lots of friends. Thank you to all Dempagumi.inc staff and Japan Expo USA organizers for putting on this great convention and making it a memorable experience for everyone. That was a fun read! It’s a fine feeling when you finally get the opportunity to meet some of your favourite idols. I had the pleasure of seeing Demp about a year a go, it was really high energy, out of about 5 groups of the night, they took the lion’s share of the crowd. I highly recommend checking out Dear Stage to anyone who visits Tokyo. It’s a nice place to hang out for an hour or 2!